THE TOUR. Click to see where the tour traveled, and what the team saw, heard, learned and experienced. THE DAILY VIDEO JOURNALS. Click to watch all 20 of the daily video journals, or to link to all 67 of our YouTube videos! THE MUSIC. Click to listen and learn about the music and musicians of Pickin' Up Tennessee. THE TEAM. Click to learn about the great people behind the scenes (and behind the cameras) of Pickin' Up Tennessee. THE BUZZ. Click to read what the media had to say about Pickin' Up Tennessee. THE CD/DVD. All the music, all the movies, in one eco-friendly package. Click to order yours today. Pickin' Up Tennessee was the first music-centered litter-awareness campaign in the state since the popular "Tennessee Trash" ads of the 1970s—but with an important twist. Instead of focusing on the one thing we all hate about Tennessee—the litter—PUTN highlighted the things we all love: Tennessee's incredible scenic beauty, her rich musical heritage and her generous, volunteer-minded communities. 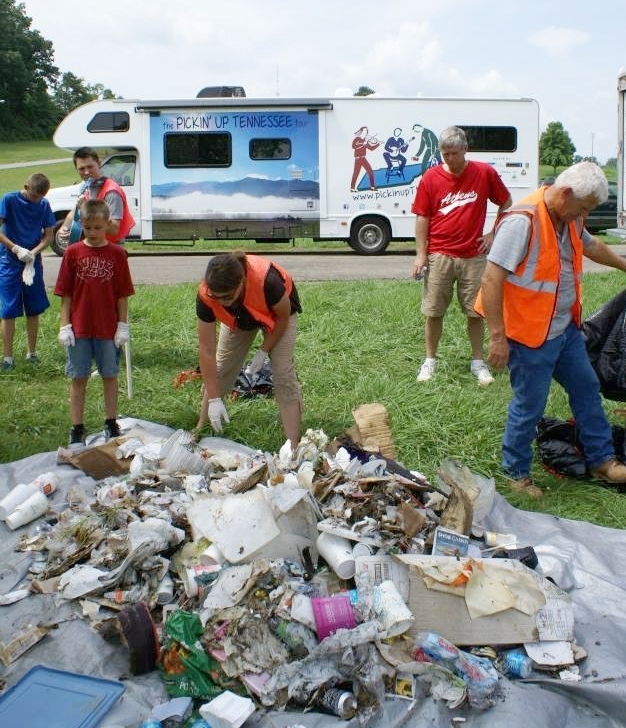 Every year, Tennessee spends millions of dollars cleaning up millions of pounds of litter from thousands of miles of roads and waterways and public spaces. And even though Scenic Tennessee believes a 5-cent deposit on beverage containers is a more effective and long-lasting solution, there's a lot to be said for raising awareness. So when we learned that Tennessee's Department of Transportation planned to give out $1 million in grants to tackle Tennessee's litter "beyond routine maintenance," we came up with Pickin' Up Tennessee. Our project, awarded the maximum $100,000, called for a family of Chattanooga filmmakers to travel the state for a month aboard the Pickin' Up Tennessee RV, a 32-foot motor home bearing the message: "Love the land. Lose the litter." Along the way, they would film community litter cleanups, visit iconic scenic spots, tour hidden local treasures and record a sound-quilt of authentic Tennessee music, from blues to bluegrass to gospel, performed by more than 120 all-volunteer musicians, singers and dancers. In the evenings, they'd camp at one of Tennessee's award-winning state parks (courtesy of the Division of State Parks), where they'd blog about the day's experiences and upload video to the PUTN YouTube page. The tour launched, with much media encouragement, on June 1, 2013. 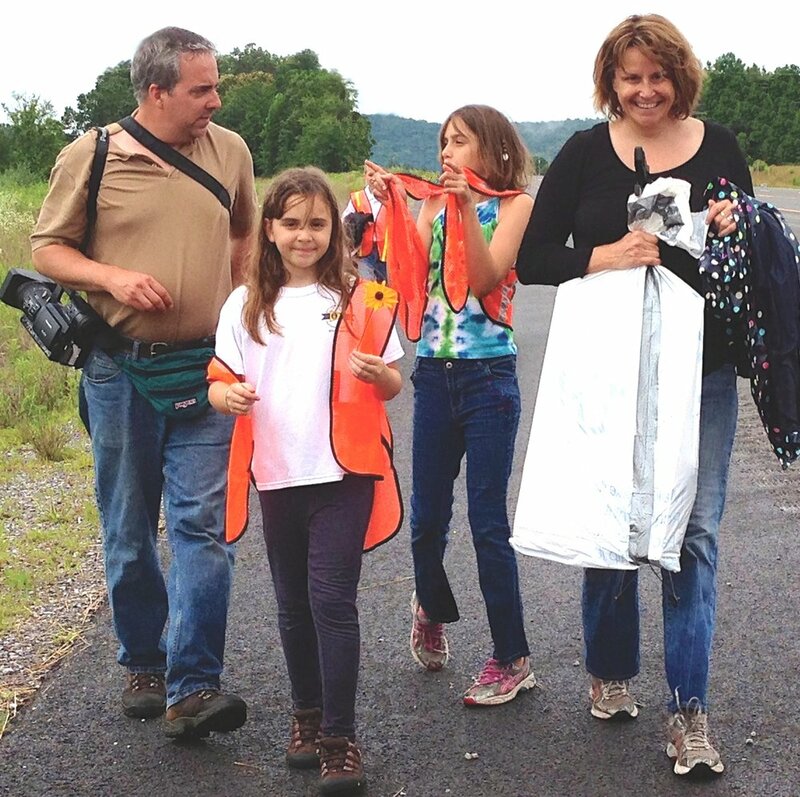 For the next four weeks, Dave Porfiri and Linda Duvoisin, principals in Mindflow Media, and daughters Jane, 10, and Harlan, 8, served as roving ambassadors for a clean and sustainable Tennessee. Project coordinator Marge Davis tagged along with her Big Orange tent, and Mindflow Media's technical crew joined the fun at a number of stops along the way. Some 2,800 miles, 500 volunteers, 67 videos, 38 songs, 23 cleanups and roughly a ton of litter later, the active portion of the project came to an end. Although the PUTN website was retired in 2018, most of its contents have been transferred to this site: Just click on the links to the left to learn more about the itinerary, the team, the music and of course the movies—the "daily tour videos" that run an average of five minutes each. For a four-minute "Tour in Review" of the entire four-week odyssey, click on the video below. Finally, if you'd like to have a keepsake of this one-of-a-kind adventure, click here to order the Pickin’ Up Tennessee CD/DVD. This three-disc set, containing two hours of music on CD, four hours of video on DVD, and twelve pages of liner notes all beautifully packaged in a recycled eco-wallet, is available for just $20 (with a share of proceeds earmarked for the volunteer groups who supported the project). Better yet, become a member of Scenic Tennessee and we'll send you a complimentary copy. Above: Husband-wife filmmakers Dave Porfiri and Linda Duvoisin of Mindflow Media in Chattanooga, and daughters Harlan, 8, and Jane, 10, return to the Pickin' Up Tennessee RV after a cleanup in Wartburg, Morgan County, on Day 14 of the "Love the Land, Lose the Litter" tour in June 2013. The family spent four weeks on the road, covering nearly 3,000 miles, visiting more than 40 counties, filming 23 performances of Tennessee music and documenting 20-plus litter cleanups. Below: With the PUTN RV in the background, cleanup volunteers in Athens, McMinn County, separate recyclable items from collected litter. Of the more than one ton of litter picked up during the month-long tour, roughly half was recycled. The Division of State Parks generously provided an extra campsite for tour coordinator Marge Davis and her Big Orange tent. 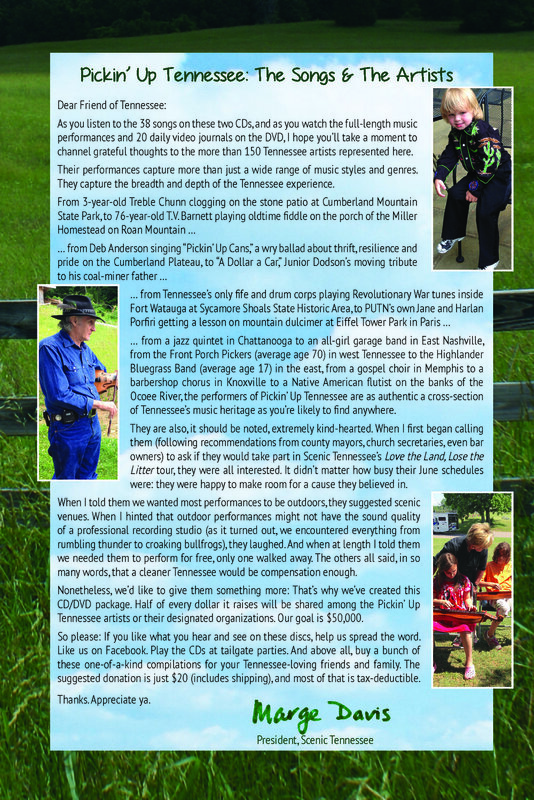 A letter of thanks to the people of Pickin' Up Tennessee, from the tour coordinator.